This is the final blogpost for my GSoC project for the Freifunk-API Query Client. We want a comfortable tool to query all the Freifunk API files as there are nearly 100 communities all over Germany providing their data. There are already several applications like our community map, a common calendar, our feed aggrator or the community podcast collector. But it’s still hard to find communities by properties like routing protocols or focus topics. When we began this project we only planned to query the generated JSON data for the community in a browser and additionally provide query results via a webservice. But then we talked to several people and we heard about DeepaMehta with features like connectors to OpenStreetmap. So we did something what you don’t do normally: We changed our project goals before the midterm evaluations. DeepaMehta is not just another database product, it provides a different way to store and handle data. It uses a graph to store connections between items and allows to modex complex datatypes and associations between them. We had to change our mind and had to learn a new kind of thinking. The API data is constantly evolving and changing and there a lot of cross-references in the data e.g. links to various nodemaps. We think the switch to DeepaMehta is useful because we can query the graph and add new relations and data without problems. It’s difficult to handle different spec versions if you want to query all API files, because some fields changed, other fields were added to the specs or got another meaning. In an ideal world all communities update their files as soon as possible. But we all know, it will never happen like that. As a workaround we first focused on less fields, available in all versions. We’re able to import communities from the API directory as a base entity. We also tried some different ways to import and store the specs, but we need some improvements here. By using the summarized API file, the import of our payload can be done via the DeepaMehta REST API. The switch to DeepaMehta brought a lot of complexity to the project and I’m personally not happy my results at this point because I had trouble to spend enough time for the project. Additionally some basic problems like dealing with changing schema and data import are not really solved well at this point. The data is in DeepaMehta and can be queries with the included client but it’s not in a state where it’s usable for the community. Overall the GSoC was an interesting experience for me. Through I’ve failed to set aside enough time for the tasks. The timely overlap with university lectures does not make it easier. So I can only recommend to know beforehand that you’ll have enough time to accomplish your goals. But the support from the Freifunk community was always great and helpful! As the project is not a state that can be considered ‘ready’ I’m continuing working on it. I definitly want to finish the work at least to point where it can be used by the wider Freifunk community. The default DeepaMehta client isn’t designated to query a lot of fields like our API provides. Here we need a new web based client to provide users an interface to select fields and get a proper response. Work will continue on integrating the API data and DeepaMehta. Moreover I’ll suggests to apply to GSoC to a lot of friends! I am very happy to have participated do GSoC 2014, this experience have permitted to me to learn a lot about opensorce comminity and programming, i have learned also Lua programming language, while it seemed a little ugly to me in the firsts times I ended up loving it. This GSoC project permits to people installing Libre-Mesh on their devices and have device specific quirks already solved by the hardware detection module, without user intervention, while it permits to developers to write little modules to easly supports new hardwares and solve their quirks. In particular in the second part of my GSoC I have improved hardware detection, in particular I have created a module to autoconfigure TL-WDR3600 and a module that permits to Libre-Mesh to detect wan port of a lot of routers taking advantage of the OpenWRT infrastructure. While creating those new modules I have also realized how to improve general Libre-Mesh infrastructure and committed various improvement to the hardware-detection branch, that is now in the official repository ready for merging in develop branch. Futhermore, during the last phase of this project I have optimized the code including modules I have written in the first period like usbradio detection module. Obviously all this work have been possible thank to the help of the community that helped me in the whole coding period. – learn what users expect from a social network. Figure out who should receive which messages. The Secushare homepage says: “RetroShare should provide more social functionality” Indeed! Every country is spying on their citizens. Storage, computing power and bandwidth became cheap. These are good conditions to build a distributed social network. The first step was already started a while ago with the General Exchange System for Retroshare v0.6. This project is the second step in this direction. One thing is missing: a release for normal users. These issues where solvable. A real pain with Wt is the layout and UI design testing. You first have to go through the complete compile and start cycle to see changes. What if you missed a closing tag in a HTML template? You have to recompile and restart. Now i saw that with real web technologies you can see a live preview while you type. I think when doing layout and design it is important to immediately see the result. This is not possible with Wt. Conclusion: you can build a web interface with C++. But hard coding CSS class names and embedding HTML snippets in C++ is a pain that should be avoided. I did not know about these web technologies when starting the project. This is some sort of a chicken-egg problem: Retroshare does not have web developers, because it doesn’t have a web interface. And there will be no web interface until a web developer can show how it can be done. Gladly there is now a web developer who can teach me how to make a web interface. I will do more research for a JSON over HTTP interface for Retroshare and rssocialnet. If this stays a good idea i want to implements it. Maybe i will try to start a new web interface. But i hope someone else is faster than me. I prefer to work on the rssocialnet backend and libretroshare. Whats more a web interface is a perfect place for new contributors. If i would make a clearly documented JSON over HTTP api, then a web developer would not need C++ knowledge or experience with libretroshare. A dream is to bring Retroshare to Android. This is possible, but we have to make a new touch-friendly user interface and we have to optimize Retroshare to make it more battery friendly. I currently see two ways to build a GUI for Android: with QML/QtQuick or HTML based with the Ionic Framework. There is already a QML prototype. – can you make a better gui mockup than me? – which frontend technologie should be used? 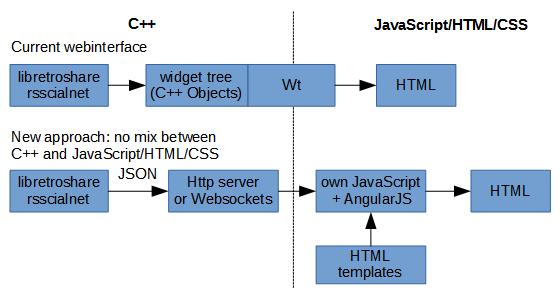 QML/QtQuick or Bootstrap and AngularJS? – what are the requirements for a first release? – how can you use your skills to help? Thank you Freifunk and other mesh network communities for donating one GSoC slot to Retroshare. This was a good decision, it made it possible to start a mesh friendly social network application. Content is obviously the most important element of a social network. Currently only support for plain text is implemented. The content can have an author, but this is not required. Future: It would be nice to have support for images. This is very easy on the backend side, but it needs a frontend which scales the image to fit on the screen. With Retroshares file transfer capabilities it would also be possible to publish large files like audio and video files. It would be nice to restrict access to content to a set of people. Retroshare is prepared for this and it only needs small changes in the social network backend. Of course this requires a user interface to sort people into circles and to select circles. Content alone is useless without a place where it gets displayed. As explained in a previous blog post, every piece of content is stored for its own. To make content visible it has to get referenced on a wall. This happens automatically on the own wall when creating a new post. It also gets triggered by clicking the share button. A reference always has an author. Future: maybe allow to reference content from other services. For example if Retroshare gets a Photo Share service, allow to reference a picture or photo album on the wall. A Wall is a place where a profile text, an avatar image and references to content are stored. A user subscribes to another user to download all posts referenced on the wall. The wall owner and others can reference content on a wall. All new posts are collected and displayed in the news feed. A news feed shows the new content, the comments and how others interact with the content. Who commented this post? Who shared this post? Currently the news feed displays posts in the order in which they where received. Future: it is probably desired to have a more advanced logic to sort news feed entries. Imagine a user comes online after a week and gets bombed by hundred new posts. It would be possible to sort news in two dimensions: topics and rating. Example: have one tab for content from close friends, and one tab for other content. Then calculate a score to display more important content at the top. This requires a bit of backend work, but it is doable. Users can interact with content in two different ways: they can comment it, and they can share it. Sharing creates a reference to the content on the own wall, and thus forwards the content to friends. Comments are stored with the content, so everyone who received the content will also receive the comments. Future: one can think of other ways to interact with content. Examples are like, bookmark, vote and hide. In general these interactions are each a form of tagging. For the backend it does not make a difference if content is tagged with “GSoC14” or “like” or 3.1415. This is more a matter on the frontend side: which meaning does the tag have for the user? How does the frontend show different tags? (star, heart, thumbs up, plus sign, text, …) How can the user filter posts with specific tags? There has to be an entry point to let the user see the people around him. If the user recognizes a known person he might want to subscribe to this person. For now there is a widget to display all identities with their name and avatar image. Of course later this list should get filtered to fit on the screen. Retroshare circles could be used to make friends lists accessible to friends. This would allow automatic circle intersection to search for people the user probably knows. Below is screenshot of the Retroshare social network plugin. Here it is my second blog post for the Mid Term Evaluation of GSOC2014. As I wrote in the previous one, I’m working on Netengine, a Python module to abstract network devices and get information from them. The work is going very well, I’m learning new things every day with the help of my mentor, Federico Capoano, and I’m very happy with the development. In this first part of the work we completed as per goals, the SNMP back-end for AirOS and OpenWRT firmwares. The most difficult part of this first part was to work with SNMP (Simple Network Management Protocol) because I had never worked with it, so I had to learn it’s basics and how it works, in particular it’s way of retrieving info from devices. It uses different codes (MIB), everyone of it gives access to different information of the device (e.g device name, addresses, interfaces); so before starting to write I had to look for the correct MIBs to query. Now we are focusing on the ssh.OpenWRT back-end ready to switch the next one on the list once completed. I’m definitely very happy with how the work is going, with the communications I’m having with my mentor and with all coding practices I’m learning from him. The program gave me not only the possibility to improve my skills but also to meet new people very experienced on the field. The next step is to start coding on the new back-end, probably an HTTP back-end for AirOS, to complete the program in time. For further questions on the project please visit https://github.com/ninuxorg/netengine or email us at ninux­dev@ml.ninux.org. This post will give an overview about the ongoing work on the API query client GSoC project. As I’ve wrote a few days ago I met Jürgen Neumann at the WCW 2014 and he introduced me to DeepaMehta. We decided to use this tool as a database for the API data. This approach is quite a leap from my original proposal and idea but after a few discussions we realized there are a lot of benefits to this approach. Here I want to give a short overview about this new approach. We have a graph that we can traverse for queries. It’s straight forward to e.g. list all organisations, that a person is a member of. To take an example from the API data: We want to know which communities use “olsr” as their routing protocol . This would be an instance of the topic type “routing protocol”. We now only need to follow the links to all instances of the type e.g. “freifunk-community” that are connected to the “oslr” instance of the “routing protocol” topic. This would allow for flexible queries. Another example would be a map where all instances of location topics are displayed and their parent-topics are included as label for the points on the map. If e.g. node data is present for communities this would allow for a global node map that shows not only node locoations but also community event locations and meeting places. Of course there is a huge amount work do before this will be working but overall I hope this explains why there are a lot of benefits for using this representation. At the moment there is a specification – a JSON schema file – for the API data and an instance – a JSON API file. At first, we need to put the schema into the DeepaMehta platform. This is possible using a plugin that creates the topics in DeepaMehta for the entries in the JSON schema. The next step is to feed the current data into DeepaMehta. This creates instances of the previously defined topic types. E.g. a topic for each community. Once the data is in DeepaMetha it’s possible to query that data. We can now speak JSON over HTTP using REST with the platform and present the results in various ways. E.g. display communities in a map or provide an text interface to query the data. DeepaMehta already provides an REST API and a web-based interface for exploring and editing topic maps but while testing and playing with the interface we found it too complicated. Feeding the data by hand into the plattform is not practical and I’m working on an import script for the schema and the API data. At the moment mapping the basic JSON types (string, integer, ..) into DeepaMehta is working but more works need to be done to get a better representation. Once the data is in the focus will shift on a doing actual queries. Complexity. These are for the most part new concepts for me and I had little prior experience with semantic web technologies. DeepaMehta also covers quite a few other usecase and I need to learn more about the system. Doing the actualy queries and traversing the graph is something I need to find a workable solution for. There are also different specifications of the API schema and different communities use different versions of the API. At the moment I’m ignoring that detail but here I need to find a solution. Another nice to have feature would be access to historic data. Lots of interesting problems.. unfortunatly I’ve been short on time in the past days and I’m quite behind the shedule but I’m optimistic that this approach is flexible enough to provide a solid ground all kinds of experiments with data. Once queries are possible things will hopefully move forward at a faster and more visible pace. This entry is for updating the information regarding this GSoC Project focused on the automate of BGP-BMX6 metrics and routes exchange and “translation”. During the WBMv7 in Leipzig, the WiBed platform  was presentated as well as the GSoC project where I am participating. WiBed was used to deploy the testbed network where many routing and mesh related experiments were executed. I was participating in the deployment and development teams of the WBMv7, so I contributed in many bug fixes and platform improvements. The WiBed project is important for the GSOC because it provides a testing platform very similar to the production environment where we will apply the results of the GSOC project. Currently I am studying and understanding the basis system we need to accomplish the objectives of my project. I am working on Bird4 and Bird6  configuration transition to UCI and LUCI willing to give to the OpenWRT project and community a more user-friendly Bird Daemon configuration. For those who do not know, Bird is a lightweight and flexible BGP daemon which may be used as an alternative to Quagga (which is actually very heavy). Once we got an usable version, we wll upload the work done to public GIT repository following the standard OpenWRT feeds format (so it might be included in the official repositories). To test our advances and implementation we are using the WiBed platform network deployed in our laboratory (at UPC university in Barcelona). The first production test will be made in the QMP  network we have deployed in Barcelona. The most challenging feature in our project is the exchange of routes (and associatd metrics) between routing protocols (BGP and BMX6  in our case). We (me, the workgroup and mentors) are still discussing about the different ways to implement it and how to use the Bird solution to Guifi.net  where the main protocol is BGP and the most common OS is the privative routerOS from Mikrotik. Including Bird in the open/libre firmware QMP will allow people in Guifi.net to use this solution instead of routerOS. However to make the interconnections between the QMP (Mesh) networks and the current BGP/Infrastructure we need the called frontier (or border) nodes (those who exchange the routes between both network clouds). To not overload the current mesh clouds (running with BMX6), we will install a BGP Bird instance only in these QMP border nodes. They will exchange routes and metrics in the entrance of the network and summarize the result by publishing the aggregated routes to each network. Another idea we are considering is to create a very small and simple OpenWRT image with the BMX6 daemon ready to perform the routing. This image may be installed as a virtual machine in the RouterOS firmware (present in 50-60% of the Guifi.net nodes). So Mikrotik nodes will be able to route BMX6 packets thus the BGP instance will not be longer necessary (we believe mesh routing protocols are a much better option than BGP/OSPF for a WiFi network). This approach is compatible with the (previous) border nodes one. We will provide both options to Guifi.net users to let them decide. Finally, to conclude this mid-term report, say that we expect to finish the project in time and just mention that in the coming days we will start testing the first solution in a real production network. From the 29th May to the 1st of June we were with Andi and Bernd from Weimarnetz at the wunderful c-base Raumstation. We visited the Wireless Community Weekend. It was my first experience of this kind of community event and I enjoyed it very much. Beer and Bratwurst did harmonize quite well with technical talks about OpenWrt and the Freifunk Community. I was especially surprised how diverse and open the community is and how enthusiastic everyone involved was. Andi and Monic talked about the progress on the Freifunk API and presented their work. 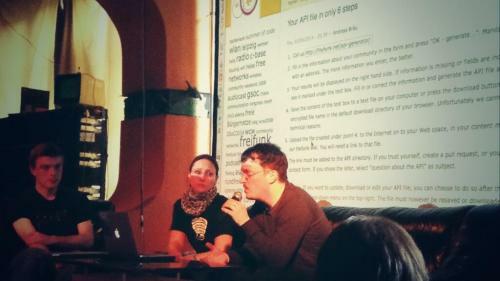 At the end of their talk I had the chance to present my work on the query client for the API. Here are the slides. Shortly after the talk Jürgen Neumann from Freifunk Berlin came to me and introduced me to DeepaMehta. My original plan was to use something like NodeJS for the backend the storage of the API data but DeepaMehta looked promising and offers unique features I didn’t even thought off. So after talking with Andi about it we decided to use DeepaMehta as the foundation and storage tool for the API data. A seperate blogpost for the GSoC midterm evaluation will outline my work in this direction. Overall it was a very exciting weekend for me at #ffwcw 2014.